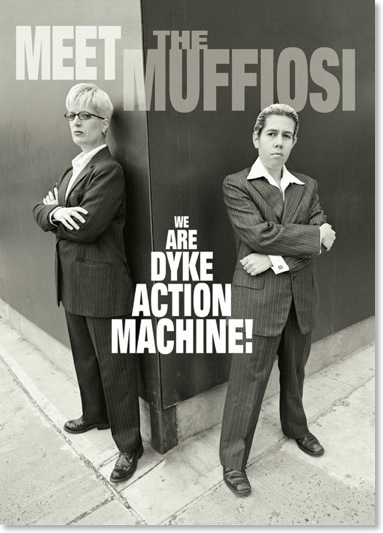 Dyke Action Machine! (DAM!) is a two-person public art project founded in 1991 by artist Carrie Moyer and photographer Sue Schaffner. Starting in 1991, DAM! blitzed the streets of New York City with public art projects. Be your own Dyke Action Machine. Steal, print and enjoy some of our most popular agit-prop, in your very own home. At last, Dyke Action Machine has figured out how convert lesbianism into a viable commodity that can be bought, sold and traded. "DAM Incorporated" is our indispensable guide to selling out.